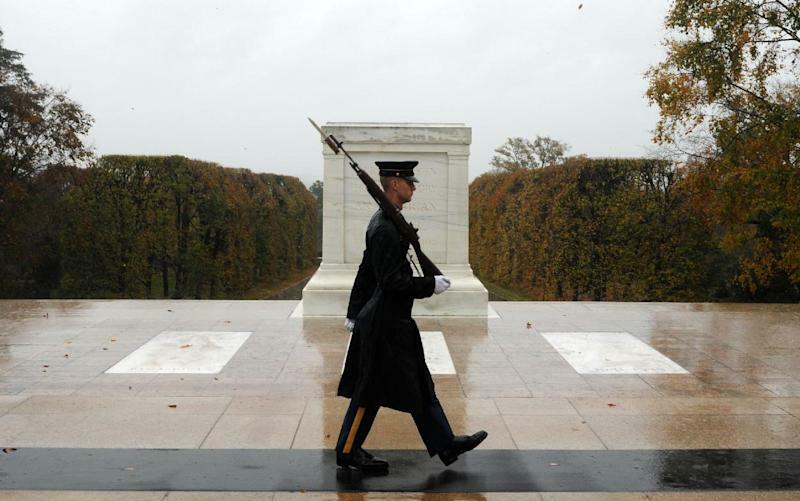 ARLINGTON, Va. (AP) — In the face of Hurricane Sandy, the Army continued to guard the Tomb of the Unknowns on Monday but not with the familiar, choreographed 21 paces that the public typically sees. A photo that went viral on social media of three soldiers from the Army's Third U.S. Infantry Regiment, known as The Old Guard, keeping watch over the tomb was actually taken during a September rainstorm. The Army became aware of the photo and said on its Twitter account and to media that it was from September. The Army handed out a photo that was taken Monday morning before Arlington National Cemetery closed because of the storm. Afterward, when morning funerals were completed, the Old Guard soldiers were still on duty but had moved into an enclosure covered by a green awning known as "the box," about 20 feet away from the tomb, according to regiment spokesman Maj. John Miller. He said if the weather becomes intolerable, the tomb can also be guarded from a room inside a nearby amphitheater. But no such order was given on Monday afternoon.